THIS SERVING PLATTER WAS PRODUCED BY WEDGWOOD IN ENGLAND. 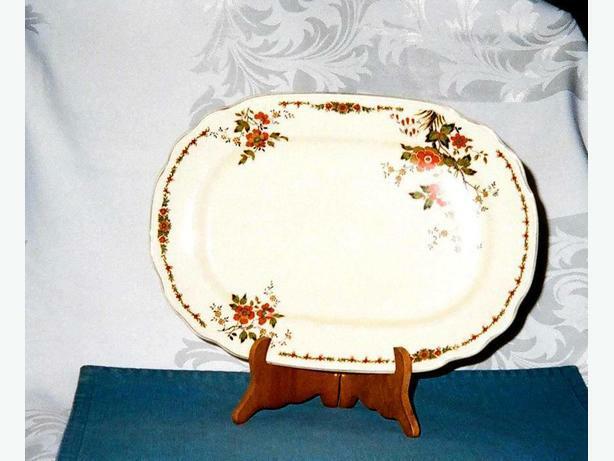 THE PATTERN OF THIS LARGE OVAL SERVING PLATTER IS TRENTHAM . IT DATES FROM AROUND 1930. IT MEASURES 14 1/2" X 10 1/4". IT FEATURES A HANDPAINTED FLORAL MOTIF, ORANGE FLOWERS WITH COCOA, GREEN AND BLACK DETAILING. THE LEAVES, DONE IN GREEN, COCOA AND BLACK PROVIDE BACKGROUND AND DEFINITION. THE RIM HAS GOLD GILT TRIM. THE BASE COLOR IS CREAM/IVORY. THE PLATTER IS IN VERY NICE CONDITION. FOR OTHER ITEMS OF HOUSEHOLD INTEREST, ANTIQUES AND VINTAGE COLECTABLES PLEASE VISIT MY OTHER ADS.